When crossing the administrative border with the occupied Crimea at the checkpoint “Kalanchak” Crimean Tatar activist Raim Ayvazov was detained by Russian border guards. According to the public association Crimean Solidarity, Ayvazov organizes sending parcels to the Rostov-on-Don detention center, where political prisoners arrested in Crimea are being held. The activist was detained at 12 o’clock at night. He soon told his relatives that they would not let him go, because they were expecting the arrival of a “person for conversation”. After that, nothing was heard from Aivazov. Relatives of the detainee called the hotline of the Russian power structures and there they were informed that it was possible to obtain information about the detainee in Simferopol in the “border guards agency of the FSB in the Crimea”. The family of the detained Raim Ayvazov arrived in Simferopol at the indicated address, but they were denied information. 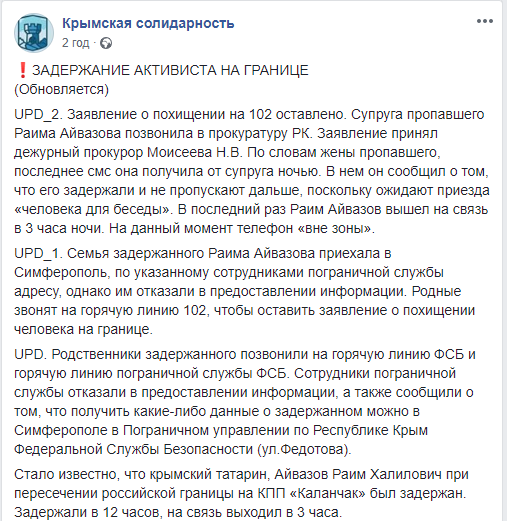 Relatives called the police to file an application about the abduction of a person at the border, the Crimean Solidarity reports. Soon, the “prosecutor on duty” N.N. Moiseyev accepted the abduction application. On March 26, at the administrative border with the Crimea (Kalanchak checkpoint), FSB officers detained two activists of the Crimean Solidarity – Remzi Bekirov and Ruslan Suleymanov. After some time they were released, but later, during mass raids in the Crimea, they were repeatedly detained. On January 29, while crossing the administrative border with the occupied peninsula, four Crimean Tatars were also detained at the Kalanchak checkpoint. Two hours later, all the detainees were released.